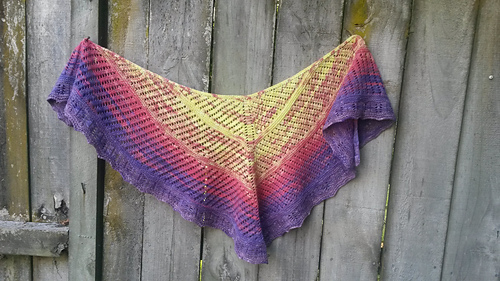 A small shawl inspired by light rainfall in a leafy garden. The gentle textured openwork pattern is worked on either side of a central spine, like rainwater falling at different angles. Rainwater Mint is all about freshness and ease. The shawl is light and airy, and a good size and shape to wear. 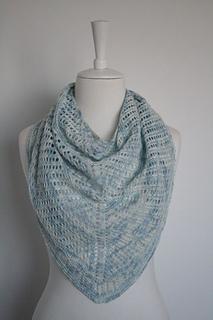 This is an enjoyable knit; a relaxing project that grows pleasingly quickly. A triangular shawl with a curved lace edging, Rainwater Mint is designed to make the most of one skein of Augustbird Songlark. This beautiful merino from White Gum Wool has a generous yardage. If your tension differs from the pattern, you may find that you need to reduce your needle size in order to knit the shawl from one skein. Originally designed for the Augustbird Tea Time Club 2015, Rainwater Mint is now available to everyone. I hope it brings you refreshment and relaxation. This pattern has been test-knitted (thank you testers!) and professionally tech. edited. Now available: the companion pattern, written for sport-weight yarn - Rainwater.